Schwerin Castle (German: Schweriner Schloss) is a castle located in the city of Schwerin, the capital of the Bundesland of Mecklenburg-Vorpommern, Germany. For centuries it was the home of the dukes and grand dukes of Mecklenburg and later Mecklenburg-Schwerin. It currently serves as the seat of the state parliament. 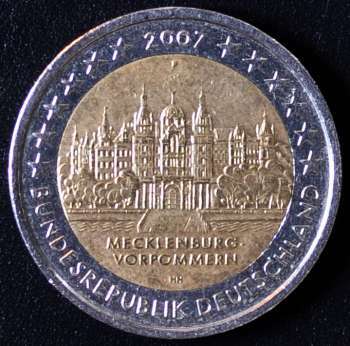 In the centre the Castle of Schwerin; lower in two lines: MECKLENBURG - / VORPOMMERN; along the bottom edge: BUNDESREPUBLIK DEUTSCHLAND (Federal Republic of Germany); along the top edge year of issue 2007 divides twelve five-pointed stars - symbol of the European Union. 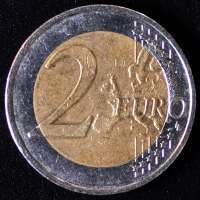 Issued on 2 February 2007. (J) Hamburgische Münze (The Hamburg Mint), Hamburg.